We went to visit our friend, Marc Valitutto the General Curator and Veterinarian at the Staten Island Zoo. Marc gave us a fabulous tour and showed us the amazing changes he has made in this 75 year old zoo. The collection has jumped from 250 to over 350 species and continues to grow. In a few weeks, their two gorgeous Amur Leopards will move into a 4,500 square foot exhibit which will be three stories high – making it one of the largest exhibits in the nation. 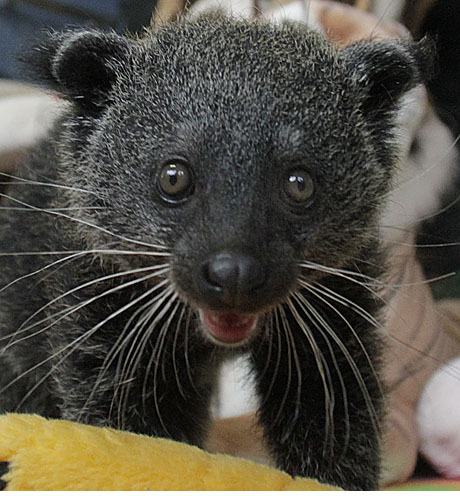 We met the zoo’s new adorable baby binturong, (smells like popcorn) in the new nursery, which can also be viewed by the public, where we met a young fennec fox, sloth, baby crane and African porcupine. A shout out to Marc for his generosity and continuing great work. The Staten Island Zoo, which proudly calls itself ‘New York’s Biggest Little Zoo’ is a great place to visit. We went via the Staten Island Ferry which in and of itself is a great adventure. 1. October 20 – 8:30 to 10:30 – Fall Foliage Series – A few spaces left in next Sunday’s guaranteed fun pumpkin/fall foliage extravaganza. 2. November 17 – 8:30 to 10:30 – Grandparents Photo Series – A fun family experience spending time with the tropic zone birds, watching them eat breakfast, taking photographs with your kid(s) . 3. November 24 – 8:30 to 10:30 – Breakfast with the Birds – Spend time with the tropic zone birds, watch them eat breakfast, photography heaven. I must visit! I so want to see the leopard exhibit! You are the best! Love the frog on the lizard!